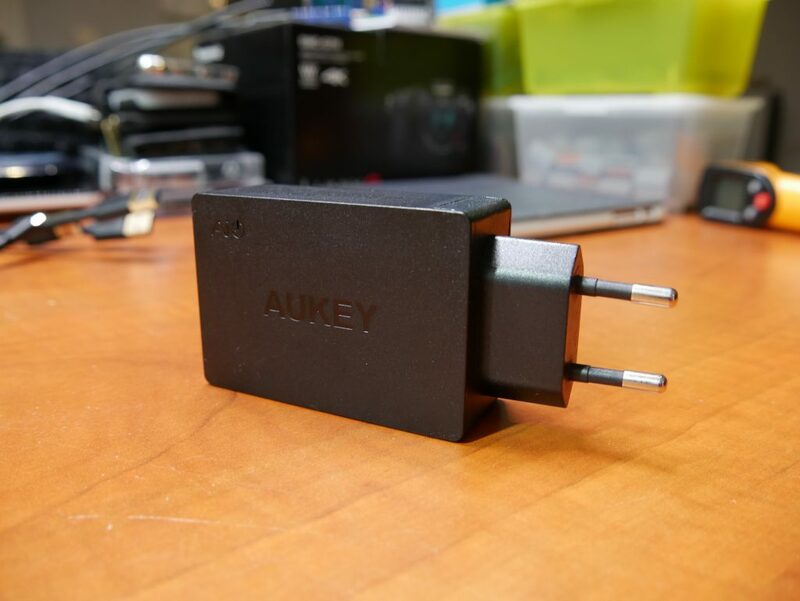 This time I’m testing an Aukey PA-T14, 3 port Quick Charge 3.0 Phone charger. Much like the previously tested Tronsmart chargers this charger offers 2 “normal” ports and 1 Quick Charge port. This is the video review I did of this unit. 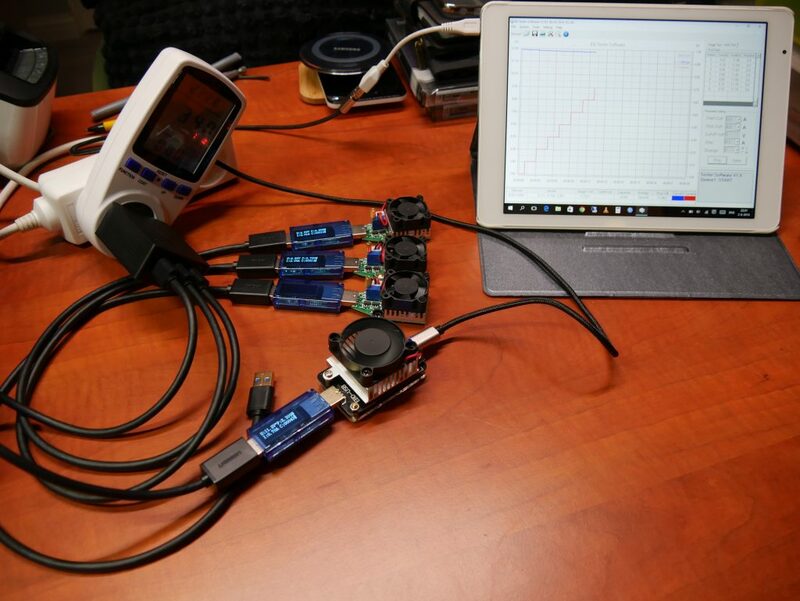 You will see this charger in detail and I you can get an impression of my testing setup. I also stress test to unit to really “fully load” it! 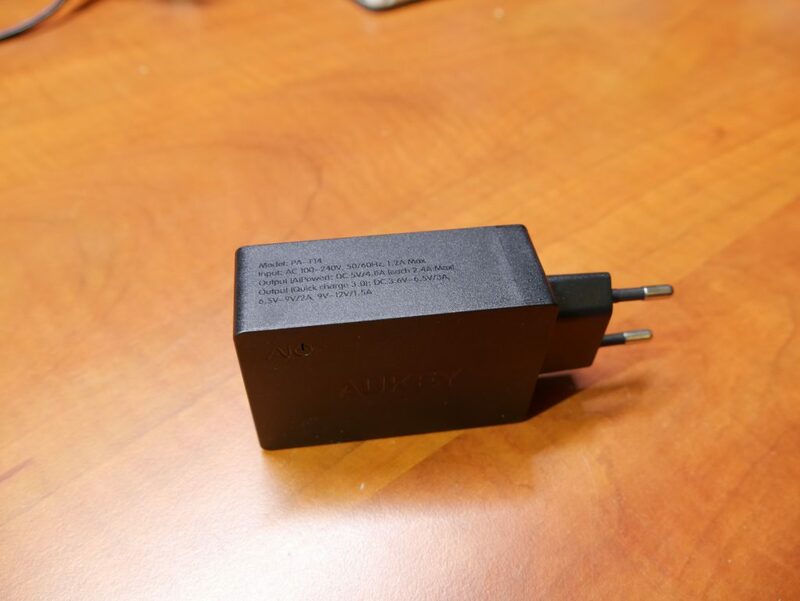 The charger itself comes in a medium size box and includes a 3FT (1 Meter) Aukey charging cable. These cables are of excellent design so I’m very glad to see it included! You can learn more about the differences in brands of charging cables here. As normal for me I bought this charger on Aliexpress, you can do so yourself by clicking here! Or take a look at all Aukey has to offer here. The test setup using the EBD-USB to fully load it! The test setup used can be seen in the video and in the phone above. As always I test using variable 5v loads set to 2A for all ports and then I also run tests with and without loads loads on the middle port (normal port) and the QC3.0 port. After that I also do some QC3.0 tests with and without any other load using the EBD-USB tester. As you can see in my video, during all tests I use 50cm USB3 extension cables. The voltage drop in these cables is about 0.05v to 0.10v depending on load. Please that into account when reading the graphs below. Quite similar to the previous Tronsmart charger, this charger also holds it’s voltage very well until the charger cuts off the port at 2.75A. The Quick Charge port show similar results. Voltage stays high (well within tolerance) but the Amperage rizes high up to about 3.5Amps total. At 9v the port behaves much the same. Voltage stays very steady and the Amperage rises to about 3.2Amps. And again we see a very well behaved pattern topping out at around 3.0Amps. It does show a weird pattern where the EBD-USB asks for more charge but the Aukey won’t supply it, instead it levels off and stays there. Since this behavior happens well above the 18 watts maximum a real Quick Charge device will ask for (We’re up to about 36 watts here), this does very well. With all the ports loaded with 5v 2Amps we see that the middle port cuts off a bit sooner then it did without the other ports loaded. Still this port combined with the 2x 5v 2A load on the other ports still does very well up to about 2.5Amps. As seen above the Quick Charge 12v test also shows a bit lower cut off value with a 5v 2A load on the other ports. The charger ‘only’ manages to achieve about 2Amps which translates to about 24 watts. 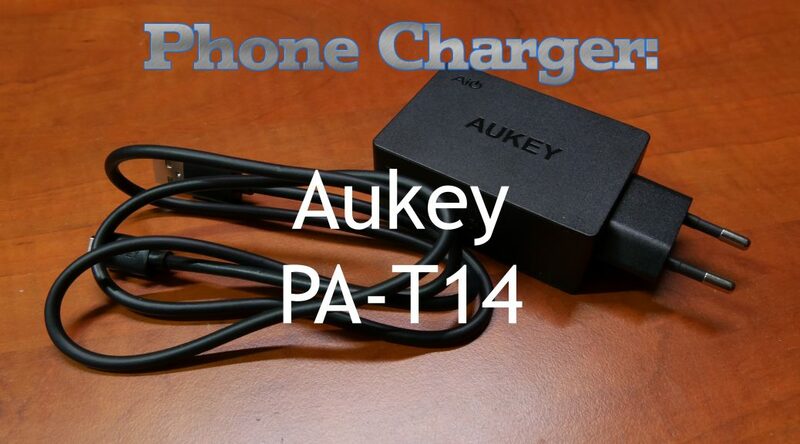 The Aukey PA-T14 is a great little charger. Only in the last fully loaded test with both normal ports supplying 5v 2Amps we see the total power the charger can deliver start to drop with the QC3.0 port only able to deliver 2.0Amps. But since that’s still well above the required 18 watts for a Quick Charge port it shouldn’t slow down charging! As you could see in the video even running full load (QC3.0 at 12v 2A, the other 2 ports at 5v 2A) the charger doesn’t get exceedingly hot. It hovers around 60 degrees Celsius but never really goes much above it. All in all an excellent charger and I would very much recommend it! As normal for me I bought this charger on Aliexpress, you can do so yourself by clicking here! Or take a look at all Aukey has to offer here. I want to buy this charger, but I am afraid to ruin my phones and tablet. Is the charger suitable for these devices? Yes, I think the charger will work fine. Your devices don’t use QuickCharge though so you might be able to use a cheaper charger which does not have this. From my experiences as long as you stick to known good brands such as Aukey, Anker and Tronsmart, those chargers should perform well. If you plan on getting devices with Quick Charge, there is no harm in getting one now and it should still perform great!